Both the US and Texas Constitutions mandate the redrawing of congressional and legislative districts every ten years using population measurements taken by the US Census. This periodic readjustment is necessary to give all of the districts approximately the same number of people. If we didn't readjust the districts periodically, some districts would eventually have many more people than others, giving voters in less populated districts more influence. Also, since Texas has gained seats in the US House of Representatives in each national census in recent decades, it has needed to reapportion seats within the state. After the 2010 census, for instance, Texas gained four additional seats in the US House, more than any other state. The Texas Constitution of 1876 required that the Legislature pass a redistricting plan during the first session after the publication of the decennial national census of the population. However, the Legislature sometimes did not follow through on this obligation. This resulted in the under-representation of the people in those districts where population grew faster than the rest of the state. The failure to redistrict favored the rural areas at the expense of Texas's growing urban centers. The latter's faster population growth meant they deserved additional seats in the state Legislature and the US Congress. Because of the great imbalance in representation that had developed over the decades, an amendment was adopted in 1948 that gave the Legislature extra incentive to carry out their obligations as specified under the original Constitution. Under this amendment, if in the first legislative session after the publication of the decennial census of the population a redistricting plan was not adopted, the responsibility passed to the Legislative Redistricting Board (LRB). The LRB is composed of the Lieutenant Governor, Speaker of the House, Attorney General, Comptroller of Public Accounts and Commissioner of the General Land Office. The prospect of the LRB determining district boundaries represented a significant incentive to the Legislature to take seriously its redistricting obligation, since an LRB-authored plan would diminish significantly lawmakers' control over their own reelection fates. The redistricting process in Texas has produced increasingly intense negotiations and conflicts in recent decades as the Republican Party gained enough support to challenge, and then reverse, the Democratic Party's historic monopoly in the state. These struggles over redistricting have been compounded by profound demographic changes – considerable population growth and high rates of urbanization and immigration – in recent Texas experience. Partisan conflict over redistricting culminated in an intensely politicized process during the 78th Legislature in 2003, when the leadership of the new Republican majority in the legislature revisited the redistricting process and passed a plan supplanting the 2001 plan that had been implemented by the courts. Before the 1960s the pace of demographic change in Texas was relatively slow. Democrats dominated the political system while African Americans and other minorities were widely excluded. This meant that the social and political structure of legislative districts changed very little or were of little consequence since many working class individuals, especially African Americans and Latinos, were shut out. Changes made by both Congress and the courts in the application of voting rights to the drawing of district lines sought to ensure minority representation. Some of these new rules had unintended consequences. Several demographic trends have increased the stakes of redistricting. The process of urbanization in the post-World War II period caused profound shifts away from the countryside (which had dominated the political system) to the cities. Urbanization gave way to a long and ongoing process of suburbanization, enabled in part by the interstate highway system, which was begun during the Eisenhower Administration in the 1950s. In the last couple of decades, suburbanization gave us "soccer-moms" and "office-park dads" as voting blocs increasingly targeted by political campaigns. Manipulating how district lines are drawn in relation to these constituencies has become a high-contact sport played in the arena of state politics. 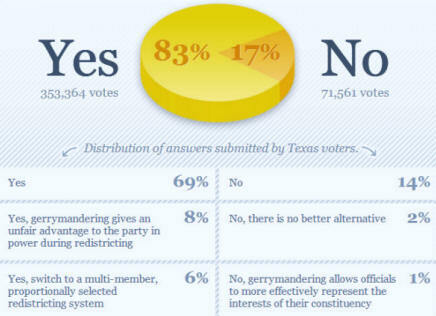 Probably in part due to the political conflict surrounding the process in the last round of redistricting, a July 2008 poll directed by members of the UT-Austin Department of Government and the Texas Politics project found that 45.5% of those surveyed in a statewide poll supported the idea of an independent redistricting commission. However, redistricting was far from a burning issue – 35% of those asked replied that they didn't know. But for those paying attention to the issue, the idea of an independent redistricting commission received support across the partisan spectrum. For this activity, you are going to play The Redistricting Game, which consists of 5 "missions." Use the instructions I've given below as you proceed through the game. Chances are the concepts used in the game are new to you. Please don't try to rush through the game or you risk becoming hopelessly confused. Instead, make certain you understand the Learn More section of each mission before you go any farther and then take your time in the Basic section of each mission. If you do, you'll understand the concepts and have no trouble with the discussion you send me. Go to the Redistricting Game. Chose the link for Mission 1: Fundamentals – Learn More. Read the brief description and the New Yorker article, Drawing the Line. Chose the Game link and then the link Mission 1: Fundamentals – Basic. The game will begin in a new window. When you finish Mission 1, go back to the original window and chose the Game link. Chose the link for Mission 2: Partisan Gerrymander – Learn More. Read the brief description and the Slate article, The Gerrymander That Ate America. Chose the Game link and then the link Mission 2: Partisan Gerrymander – Basic. When you finish Mission 2, go back to the original window and chose the Game link. Chose the link for Mission 3: Bipartisan Gerrymander – Learn More. Read the brief description and the article Texas Considers New Redistricting System. Chose the Game link and then the link Mission 3: Bipartisan Gerrymander – Basic. When you finish Mission 3, go back to the original window and chose the Game link. Chose the link for Mission 4: Voting Rights Act – Learn More. Chose the Game link and then the link Mission 4: Voting Rights Act – Basic. When you finish Mission 4, go back to the original window and chose the Game link. Chose the link for Mission 5: Reform – Learn More. Chose the Game link and then the link Mission 5: Reform – Basic. Making specific and detailed connections to the information given in the game and to course content, discuss whether or not you would support redistricting reform and why or why not. Your discussion should be thorough, specific, include relevant concepts from the course material and be free of spelling and grammar errors. Send your discussion in the body of a new email to dramyglenn@gmail.com.